Interests - Reading , puzzles, painting, ballet. My Little Pony, Trolls, Peppa Pig, Disney Beauty and Beast, My Little Mermaid, Snow White, Disney princesses. Lego, puzzles and unicorns. Izzy is a normal 3 year old. She loves to play, she’s very quick to learn, and has an infectious gorgeous laugh. Unfortunately, Izzy was suffering from a UTI, and antibiotics were not curing it. We kept taking her to the GP, but when the course of antibiotics finished, her right eye and stomach started swelling. The GP wasn’t sure why, tried new antibiotics, eye drops, and suspected it could be an allergy so we tried Piriton. The GP even felt Izzy’s liver and said it felt firm, but thought it was normal and perhaps due to her UTI. On Wednesday 22nd March 2017 we took her to A&E due to the size of her abdomen, and now the wheezing coming from the top of her lungs. Sadly we were sent away, as she was not seen as a priority, and her chest sounded clear. They did think she should have an ultrasound, but to wait for a few weeks and be put on the list for paediatric hot clinic. Friday 24th March 2017 arrived, and Izzy was very uncomfortable, her stomach was even more distended and hard, and she was struggling to breathe, with her eye still swollen. So we decided to take her back to A&E at 1pm, as Izzy was not herself at all. This time we were taken more seriously, and seen by a number of doctors, all of whom poked and prodded, and said in the end she has a problem with her abdomen that they couldn’t treat at Kettering General. They transferred us to QMC Nottingham on Saturday by ambulance under blue lights. We were very worried, but at this point no-one mentioned cancer to us. It wasn’t until we met a doctor who works on the children’s ward, who has experience in oncology, did she explain very calmly that Izzy has a form of cancer, and this is the reason we were being transferred. Saturday 25th March 2017, the day came when we moved to Nottingham. We arrived around 16:00, and we were greeted on ward E39 by a lovely group of oncology nurses. We felt lost, upset, angry, and confused. We were unsure of what was going to happen, and exactly how poorly Izzy was. We knew she was ill, but we didn’t appreciate how ill until Sunday 26th March arrived. So, Mother’s Day was here, our son Joseph was with his Granddad, and we were stuck on a strange ward in a city we have never been to. The day was busy with chest x-ray, ultrasound, and blood tests. Monday 27th March, Izzy was told they couldn’t wait any longer, and she would be first on the list for her MRI, lumber puncture, and Hickman line to be put in. We were told her tumours were very large, with the one on her adrenal gland and kidney being 7cm in size. The fluids they had been pushing through her had caused her to move into tumour lysis. We were then informed she is extremely poorly, and when she comes back from her general, she will remain sedated, and put on PICU, where she stayed for 4 nights. Tuesday 28th March we received her full diagnosis from our consultant, who is a true expert in his field. We were informed she has a stage 4 B cell non-Hodgkin leukaemia and lymphoma, which is also in all three categories (this covers solid tumours, liquid, bone marrow, bone and spinal fluid). Our lives have changed forever, and seven weeks on we are still living at Nottingham QMC, away from all our family and friends, but being supported by an amazing team on E39. So now is the time we say our goodbyes to Post Pals 😢😊. We just want to say a huge thank you to all of you who have helped keep Izzy and Joseph smiling through all of the dark times we faced on our journey. We cannot believe what a fighter we have, and the strength she had to fight many life threatening infections, stays in PICU, fungal sepsis and even being positive with CRE (Carbapenem-resistant Enterobacteriaceae) and only having one medication combination that worked to get her better from that. She has a long journey of recovery to go, but she is doing amazingly. Thank you to her monthly parcel supporters, letter and card writers, Quangle Wangle Ellie Ewbank Halima Master Beverley Ann Rudd Bev Higgins Marty Longo Anna Levermore and many more of you who have brightened her days. Sorry I cannot tag you all. This charity is amazing, and I look forward to supporting you for the future. Izzy will be ringing the end of treatment bell on 16th Jan, with end of treatment celebrations. We will be moving on from post pals, and just want to say thank you so much for everyone’s post and smiles you have bought to our daughter during these horrific 20 months of her 4 year life. Much love to you all. Look forward to now being able to have a pal of my own to support. Vikki George Ally Hawthorne thank you so much. 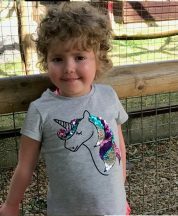 On 23rd July 2018 we received amazing news that Isabelle could stop having her IV anti-fungals Voriconazole and Caspofungin. This means so much to her and us, as now she isn’t attached to the syringe driver for 9.5 hours per day any more. She has been on those medicines for 10.5 months. We are going to Nottingham for blood tests to check the fungal infection doesn’t come back, as this caused her sepsis back in October 2017, due to invasive candidiasis in her liver, spleen and kidney. The oncology community nurses from Northampton come once a week for blood tests. We will keep on this new routine until otherwise. Sadly she isn’t feeling well in herself again, at the point of writing. She has suffered from a nasty chest infection, and is in pain in her abdomen again. She also had a form of tonsillitis, even though her tonsils were removed before cancer, so this was a surprise, and a bit like deja vu. We just have everything crossed, she can be as strong as she has been, and keep everything crossed for her. Thanks to everyone for sending her post and keeping those smiles coming. We made it home for Christmas after 40 weeks in hospital, and have remained at home. It was touch and go a week before, as she developed another UTI with a strain of E. coli resistant to some antibiotics, then she had an allergic reaction to one of the ones that would have worked. It’s ok, she was put on a oral one that seems to be working, and is now on it once a night for 3 months. We are still preparing her IV anti-fungal medicines at home, so our kitchen is half laboratory with supplies at the moment. These infusions are attached to her and run for 3 1/2 hours in the morning, and 5 hours at nights. We are so proud of Izzy, she has come so far from October, suffering from fungal sepsis, when the consultants were unsure of what else to try or if she would make it. Thankfully 3 doses of IV immunoglobulin therapy saved her life during October, and November. She has only managed 4 rounds of chemo out of the 6, and in August she was declared in remission. Sadly the fungal infection has put a hold on her receiving the last 2 rounds, and they have decided that the risk would be too high on making her extremely sick again. On Jan 17th we go in for a ultrasound at Nottingham and review with Prof, this is to check the fungal infection abscesses in her liver, spleen and kidney. They will also use it as a review for any tumours. Bloods are being taking every week by community nurse for normal blood counts, fungal markers, voriconazole levels (as this can be toxic if too high, and is one of her IV anti fungal medicines), as well as any cancer abnormalities. At the moment we are taking each day as it comes, and not rushing anything. Fingers crossed she will continue as she is, and being the little fighter she always has been. Thank you to everyone who has sent her post, cards, presents, made her some amazing gifts, or sent emails. They are really appreciated. Izzy has finally completed round 4, we had one nights sleep (last night) at Billy’s House run by Clic Sargent, but now back on the ward due to side effects of the chemo. She is in quite a bit of pain again in her gut, and is already not tolerating nasal gastric feeds. She is on oramorph, gabapentin, and now a fentanyl patch has been put on today to help. Izzy has been on extremely intense chemo throughout the last four rounds, and has two to go before she can be rid of this awful illness. Over the last five months we have spent 90% of our time in hospital. With the other 10% mostly at Billy’s House, to be close to the hospital, and a few days at home altogether. At the end of August she has an MRI booked to see if all the solid tumours have gone from organs, and bone between the eyes. She will then have her bone marrow and spinal fluid analysed a few days later, to also check the cancer cells that were there, have now all gone. Nerve wracking time for us all. A special note of thanks to everyone that has kindly been sending Izzy and Joseph post / presents and more importantly bringing them smiles. Thank you so so much!